Of all the lifepaths in numerology, 7’s are the most misunderstood. Some authors call 7’s eccentric loners, but I don’t see them this way. That’s why I’ve written this blog celebrating 7 lifepaths, and their gifts as healers of the 7th or Crown Chakra in humanity. These Souls have incarnated to teach people to think for themselves. Not an easy job! I dedicate this post to my lifepath 7 friends and readers, as well as anyone who loves this number of quiet accomplishment. Special thanks to Adeline Teoh, Julianna, Brenda Sutherland, Alison Vidotto, Megan Williams, Adi Shakti Vanessa, Kylie Blackman, Byron Katie, Isabella Karan, Jasmine Norton, Laurita, Rita, Nicole, Danielle, Andrew and Zoe for your deep wisdom. Your lifepath is your life purpose, or spiritual job description while you’re on the planet. It’s a number between 1-9, or 11, 22 or 33 (the latter are called Master Number lifepaths – some people include 44). We change lifepaths each incarnation, depending on what we want to learn next. How do I know if I am a 7 lifepath? Your lifepath is revealed by adding your DOB from left to right. Read more on lifepaths. For someone born 23 May 1950, we add 2+3+5+1+9+5+0 = 25. 2+5 is 7 is 7 hence this person has a 25/7 numerology lifepath. You can have a 7, 16/7, 25/7, 34/7 or 43/7 lifepath. Check out Dan Millman’s book The Life You Were Born to Live if you want to know more about individual paths. You can also book an in person or Skype psychic reading or numerology course in Brisbane with me. Your lifepath age is a turning point (thanks for the tip Max Coppa), so someone with a 16/7 lifepath may find their calling earlier than a 43/7 lifepath. However, I note that a 16/7 lifepath or birthday also triggers a 16/7 karmic debt number.This is a Soul who wants to unblock their mind (6th Chakra/ Third Eye) and psychic abilities in this lifetime. They may be very drawn to education and metaphysics. Along the way, they need to overcome a tendency to to see things as right or wrong. Read more on the Third Eye chakra and fresh water. -address or phone numbers. Read more on addresses. If you have been drawn to this article, you probably have 7’s in your chart or around you (as family and friends). 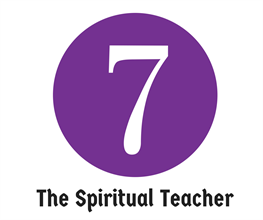 Wherever 7 appears, is where the Universe wants you to be a Spiritual Teacher. The number 7 even looks like an open book! Someone with a 7 lifepath is here to master self-respect, especially Higher Self (Soul) respect. 7 represents the Crown Chakra (the top of our heads, where the visible meets the invisible). It’s about remembering that we are all Spiritual Royalty and teaching people to trust in a higher order. Did you know? The colour PURPLE has a 34/7 vibration (see the system I used), which is no surprise as purple has been associated with royalty for centuries. Purple dye used to be too expensive for normal people to afford. Interestingly, the Crown Chakra is also thought to be purple – it’s amazing how spiritual concepts weave their way into popular culture. Depending on who you ask, the Crown Chakra includes your pituitary and pineal glands and Central Nervous System. It helps us to co-ordinate our endocrine system, receiving psychic messages and to stay on Divine time. -They question authority and bring up issues people are afraid to discuss. They’re not afraid to speak up. That makes them great teachers and challenging students. Children with 7 energy are hard to handle (unless you have 7’s too). They only respect their teachers if subjects are taught with passion and real-life examples. 7 lifepath children must be allowed to make mistakes and learn at their own speed, otherwise they become sarcastic and rebellious. -7’s are born healers, here to shine a light for others (see cartoon). They manifest miracles quickly and attract Angelic assistance due to their pure hearts. No wonder 7 is a lucky number in many cultures (read more). It’s associated with Heaven and Divine Order, e.g. there are 7 days of the week, 7 colours in the rainbow, 7 chakras (energy centres) – the list goes on. -Healthy 7’s value their time, energy and money. They are selective with where they live, what they eat and drink, who they partner and what they do for work. In that way, they are leaders who value quality over quantity. They disdain fools and value intelligence. -7s are influenced by The Moon and Neptune. In classical palmistry, Neptunians often look angelic, have a love of animals and nature and are naturally intuitive. They have great instincts and can spot a fake a mile away. Many become educators, authors, psychics or investigators. The Moon influence gives them a bond with their mothers and sensitive side. They enjoy visiting or climbing mountains (which look like 7s on their sides), living at the beach and being in water. I recommend baths and swimming for them as relaxation. -Their life histories are always inspiring. 7 looks like a cliff you jump off, and 7 lifepaths are known for taking huge leaps of faith. If they fail, they have the willpower, luck and ideas to bounce back. As the saying goes ‘fall down 7 times, get up 8’. Although 7’s may take longer to succeed, they get there eventually. -7’s are tough competitors as they are both strong and intelligent (the word SPORT adds to 25/7). Bear Grylls and J.F.K are two famous 7 lifepaths who made careers out of triumphing over difficulty. In J.F.K’s case, he became American President despite living with chronic pain. I note that his wife Jackie Kennedy Onassis was a 38/11 lifepath – 7s and 11’s attract each other, as they are both spiritually inclined. Speaking of Moon-connections, J.F.K also made the famous “We choose to go to the Moon” speech. -People with 7 lifepaths are specialists who carve a niche in their chosen industries. They prefer to maintain control over their creativity and income. Take Taylor Swift for example. She refuses to let other people sing her songs and writes all her own music. She also won a 2017 course case regarding sexual harassment by a Colorado DJ. -7 energy is associated with mystics, monks and nuns and 7 lifepaths don’t need much to be happy. They can be great advocates of simplicity and peace. The words HEART and SOULMATE add to 25/7 and many 7’s pair for life, or maintain close relationships for many decades. Once they love you, it’s forever. For brevity reasons, I’m going to skim the challenges of a 7 lifepaths – many numerology textbooks cover these in vivid detail. -7’s are notoriously stubborn. If you’ve ever met someone who kept making the same mistake, they probably had lots of 7 energy. It can manifest as extreme obstinacy, and a refusal to listen to reason. They have ‘thick skulls’, especially when their Crown Chakra energy is blocked. They tend to retreat into their heads and end up feeling like the world is against them.-7 lifepath’s may have addictive tendencies, such as smoking, gambling, overspending, drinking, playing video games, avoiding people etc. Their extreme sensitivity can cause them to keep their feelings inside, creating confusion for their friends and family. It takes patience and a safe environment for them to open up again. It can take a long time for them to forgive and forget. -When I was a University student, I loved wearing purple flares, and my friends always teased me. They said purple was the colour of sexual frustration. I never believed them, but some numerologists do say that people with lots of 7’s find it harder to meet mates who live up to their standards. A Queen or King needs to find an equal. -Someone with strong 7 energy has to find their own path to enlightenment. Following formulas and copying other people don’t work for them in the long-term. They may need to try a few careers, relationships or lifestyles before they find what works for them. Once they make a decision to move on, they rarely change their minds. -My favourite and least favourite clients have been 7 lifepaths or people with lots of 7’s in their numerology. Why? Because a 7 who’s living their purpose is committed to personal growth, easy going, willing to invest in their education and open to Spiritual signs such as 11:11 clocks. However a 7 who doesn’t trust tends to have a sharp tongue, big ego and busy mind. They’ll ask me the same questions over and over again, until I put my foot down. -I should also mention that 7 lifepaths who haven’t learned to quiet their minds through meditation or to listen to their Spirit Guides tend to give away their power. They can fall under the influence of gurus and cults at times. This may cause them to become un-grounded and ‘overly spiritual’, e.g. forgetting to eat. Places with 7 energy include: Brisbane, Australia, Fiji, Giza (well, 7 does look like a pyramid on its side! ), Greece, Jerusalem, Scotland, South America and Sweden. All places that are one of a kind and attract spiritual or pleasure seekers (PLEASURE adds to 34/7). Over the past decade, I’ve built a business in Brisbane and met many amazing healers in the area. Famous People with 25/7 Lifepaths include: Princess Diana (she was spiritual royalty in many ways and believed in psychics), Queen Elizabeth, Marilyn Monroe (Hollywood royalty), Leonardo DiCaprio, Muhammad Ali, Winston Churchill, Roger Moore (how perfect that he played 007 James Bond in seven films). Also spiritual leader Byron Katie and best-selling authors John C. Maxwell and Rachael Bermingham – see my reading for her. Famous People with 34/7 Lifepaths include: Elon Musk (at 34, SpaceX was awarded a contract from NASA), JFK ( around age 34 he won a U.S. Senate seat and shortly after, married Jackie), Johnny Depp (he’s definitely quirky! Apparently 7’s like knives, hence Edward Scissorhands. I learned this from Ian White), Taylor Swift, Lorde, Kevin Rudd (his slogan was Kevin07 – how apt. He was the odd one out – Australian Prime Ministers are generally 1 lifepaths), Bear Grylls, Elle Macpherson, Ashton Kutcher and Mila Kunis. I note that Ashton and Mila are married – 7’s are very compatible, if they have equal power. Ashton’s former wife Demi Moore is a Master 22/4 lifepath, which made them a (7+22) or Master 29/11 couple in terms of compatibility. 11 is the public spotlight number. My advice for people with 7 Lifepaths is to ‘dare to be different’. You are here to wake people up. Leap, and the net will appear. Here’s a prayer for you: Dear Spirit, I have no idea. Please show me where to focus now so that I can make a difference. I look forward to being a light in the world today, in every possible way. Help me find my way. Thank you and amen. I hope you’ve enjoyed this introduction to 7 Lifepaths. Remember, the 7th Chakra is the Crown Chakra. If you want to stay in power, you must rule from the heart, not from the head. People don’t care how much you know, until they know how much you care (John C. Maxwell, a 25/7 lifepath). -Share this with other 7’s or people who see 77 or 777 (these are codes to open the Crown Chakra – read more). Knowledge is freedom! Please maintain integrity by sending them a link to this site. For other lifepaths, click here for more details. Or, for greater clarity, book a reading with me to discover your soul contract and 2018 forecast. it’s worth the suspense – see feedback. For a reading within 7-14 days, book a Tarot reading in Brisbane with my husband Kris on 0428 626 727.He’s brilliant. I also recommend Vicki Haspels and Caroline Byrd, my spiritual mentors and gifted psychic mediums. Sarah Yip – Love you always Catherine, glad to be your friend! Sarah Yip on Saturday, 24 September 2016 1:32 AM Dear Luna – what a name – 7 is ruled by the Moon 😀 Grateful you found the post interesting, thanks a million for writing back!! Sarah Yip – No 52/7’s in my system but there could be in other systems of numerology. The lifepath suggests the turning point age so yes there is a different between 34/7 and 43/7 holders, they bloom at different stages and are also working chakras in a different order. Dan Millman writes about the lifepaths in The Life You Were Born to Live, have a look there or consider one of my numerology courses. Sarah Yip – Hi Savannah, glad to be a light in the field of frequent darkness, keep reaching into your heart and you will find the love you are looking for. There is much to enjoy about being a 7 lifepath especially when you connect with people who value knowledge and Spirit. Sarah Yip – Pleasure to assist Sheena, have a look at my Bookings page for more info, best wishes. Sarah Yip – Thanks for writing in Charles, and for your support. Have a look at my article about overcoming your fear of rejection, it may be helpful for finding your flow again. Sarah Yip – Glad you found your true path Shannamay, enjoy the winding path to healing! Sarah Yip – Happy you found this article useful Jacqueline, it always pays to keep looking until you find the sunshine through the rain. Sarah Yip on Saturday, 24 September 2016 1:31 AM Dear Song, so glad to hear the article helped!! I just read for a 25/7 lifepath client today – 7s are one of my favourite groups to talk to as they have so many unusual ideas and aren’t afraid to ask questions. Delighted you found the prayer amusing. Stay in touch. Sarah Yip on Thursday, 6 October 2016 1:16 AMHi Sharat, thanks for writing to me, I’m so glad you found the lifepath 7 post helpful. Your question is not easy to answer, there is no one path to becoming a healer. Here are some links which may help: A list of my teachers – you’ll see that it takes a community to be a successful healer, The medical stigmata in palmistry and this post on the St Andrew’s Cross in palmistry. I am not able to give more detailed advice outside of a reading or workshop. Thanks for understanding. Sarah Yip – Dear Meah, thanks for your support, I think you’d enjoy this post A Poem For My Critics very much. The only person we can ever please is ourself, to seek approval from others is like leaning on a straw house in a gale force wind. Easier said than done, I know. Cheyanne on Saturday, 29 April 2017 6:22 PM I can’t believe how accurate this all is. I’m 19. My birthday is September 26, 1997. I’ve always felt this overwhelming sense that I was put on earth to help and heal people. Even when I was younger, my father told me I would bring peace to everyone I came around so effortlessly. He said I would daydream for hours and tell him I was thinking about angels. I don’t remember this and most of my childhood is very dream-like to me. I felt like I was constantly in a haze and didn’t snap out til about age 16. I also have an extremely strong connection with music and always felt like that was how I was supposed to heal people. However, no matter how much I love something it’s always very hard for me to get myself started or not give up. I’ve had really weird interactions with strangers, people telling me about aura colors I have (pink and purple), telling me things about me that no one could know unless they were in my head, and often people seem to be very comfortable telling me very personal things, even if we just met. And I also see the number 333 ALL THE TIME. Sarah Yip – Happy to hear from you Cheyanne, 333 is not only a sign of Solar Plexus healing and the 11:11 See’rs tribe, it also suggests you are a Starseed so have a look into that. Sounds like your Dad knows your Soul inside out, what a gift. Keep following your vibes! Appreciate your support and good vibes!